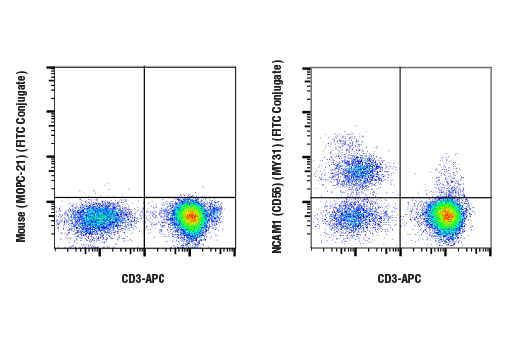 Flow cytometric analysis of live human peripheral blood mononuclear cells using NCAM1 (CD56) (MY31) Mouse mAb (FITC Conjugate) and co-stained with CD3 (UCHT1) Mouse mAb (APC Conjugate) #19881 (right), compared to concentration-matched Mouse (MOPC-21) mAb IgG1 Isotype Control (FITC Conjugate) #97146 (left). Count cells using a hemacytometer or alternative method. Aliquot 0.5-1x106 cells into each assay tube (by volume). Add 2-3 ml Incubation Buffer to each tube and rinse by centrifugation. Repeat. Wash by centrifugation in 2-3 ml incubation buffer. Resuspend cells in the appropriate volume of PBS and analyze on flow cytometer. NCAM1 (CD56) (MY31) Mouse mAb (FITC Conjugate) recognizes endogenous levels of total NCAM1 (CD56) protein. This antibody detects an epitope within the extracellular domain. This Cell Signaling Technology antibody is conjugated to FITC and tested in-house for direct flow cytometric analysis in human cells. NCAM (neural cell adhesion molecule, CD56) is an adhesion glycoprotein with five extracellular immunoglobulin-like domains followed by two fibronectin type III repeats. Structural diversity is introduced by alternative splicing resulting in different cytoplasmic domains (1). NCAM mediates neuronal attachment, neurite extension and cell-cell interactions through homo and heterophilic interactions. PSA (polysialic acid) post-translationally modifies NCAM and increases the metastatic potential of small cell lung carcinoma, Wilms+ tumor, neuroblastoma and rhabdomyosarcoma (2). CD56 and CD16 are commonly used to identify NK cells although some cells with the T cell markers CD3 and CD4 also express CD56 (3). Cunningham, B. A. et al. (1987) Science 236, 799-806. Seidenfaden, R. et al. (2003) Mol. Cell. Biol. 23, 5908-5918. Robertson, M.J. and Ritz, J. (1990) Blood 76, 2421-2438.